Flint style, circa 1990, possibly exhibited in ads for the Capitol Cafe and The Vogue. If you spot anyone you know, let me know. UPDATE: Aaron Stengel writes: Looks like the late 80s. I believe I see a some Central H.S. students in there but no Cafe regulars. The owner of the cafe moved out to the Portland or Seattle area (I forget) and got out of the restaurant business. One interesting thing about those times was that there was still a white middle class IN Flint and the "Preppies" would be seen hanging out downtown with the poor punk malcontents and skinheads. However, those photos definitely look staged at lunchtime. The only time there were that many people in front of the Capitol was for a show and there were never THAT many preppies at one. Notice the conspicuous absence of skaters or punk types. Looks like the late 80s. I believe I see a some Central H.S. students in there but no Cafe regulars. The owner of the cafe moved out to the Portland or Seattle area (I forget) and got out of the restaurant business. I see Kurt Suomela and Mike Wylie for sure. I think i recognize 2 or 3 of the people in the picture. Underneath the "A", looks like mike kennedy. he grew his hair out after graduating Powers in '84. The guy a few over to the left from him in the tan three piece is surely Dan Cronin, a Grand Blanc '84 grad. The guy in the bottom left looks like another guy I knew from Grand Blanc named Matt, but its been too long to be sure. I don't know when the Capitol Cafe opened its doors, but i don't think it was before '88 when I joined the Navy. But was preppie really in fashion that late into the 80? Are you talking about Michael Kennedy from St. Mary's? He's pictured before the long hair in an earlier post. And I think this is more of a New Romantic/preppie variation. Wow, that's an oldie. I see two very familiar faces in the middle of the bottom picture. Sporting the ever so popular shoulder length perm and oversize v-neck white sweater is my sister Suzi (Mahon) Gurry from Powers'86 and to her left in the stiped sweater is Nancy (Melet) Daly from Valley '86 staring auspiciously into the future. Suzi lives in Chicago and Nancy now resides here in Ann Arbor & is married to one of my best friends, along time Flint native named Rob Daly from Powers '85. Yeah... it was a dreadfully preppy time for us all. I see Powers people - Suzi Mahon, Ellen Daly ( I think that's her in the back row.) They look like they are shooting a ad. Is that the same Dan Cronin who went to Powers from at least '81 to'83 and had a sister named Kathy who graduated in '82? They lived over in the Carman district off of Calkins Rd., which makes me wonder whether he actually graduated from Grand Blanc or not. It does resemble him, then again I haven't seen him since the mid-80's on campus at UM-Flint, I think with a skateboard and definitely not in a suit. This photo calls for some Political Silence lyrics: "Here come the trendies/their after you/they wanna hang on/they want something to do"
-"Parasites" from the demo tape 1985? How funny I just found these to ads last week cleaning out old files. They are ads from my families store The Vogue that use to be in Flint, back in the good old days. My brother Bob Melet and I put these cards together in collaboration with Amo Bathish and Troy Farrah who owned the Capitol Cafe at the time. Bob and I collected our friends and some of The Vogue employees to do the ad. Bob took the photos. Peter Johnson, Mary Linda (Utley) Webster, Saied Farrah, ?, Steve Cronin,Hendrick Urgen, ?, ?, Brian Dutel, Michael Kennedy, Keith Keegan, Nancy (Melet) Daly, Mike Wylie, Stone Melet, Kim Dutel, Matt ?, Tim McCullum, and Kurt Suomela. Second photo same order: This photo was taken in Atwood Stadium. Peter Johnson, ? Kurt Suomela, Stone Melet, Mike Wylie, Kim Dutel, Suzi (Mahon) Gurry, Matt ?, Nancy (Melet) Daly, David Port and Tim McCullum, ?, ?. Wow, I just discovered this blog and was shocked to see the photos. A great trip down memory lane. As an alum of those photos I'd LOVE to have a reunition! Lots of faces look familiar. Names too... only some come together. 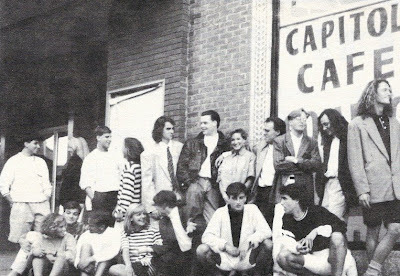 For Capitol Cafe ad, back row, 5th guy in from left in the suit is Dan Cronin... don't know a Steve and I lived right by them, the next two people I don't know but they look familiar, then there's Kevin Dutil, Brian Dutil, don'tknowthe rest on that row but they look familiar. First row, I recognize Mike Wiley, then it's a lot of don't knows but look familiars until the last two which are some guy named Gene I think and Kirt Suomela. 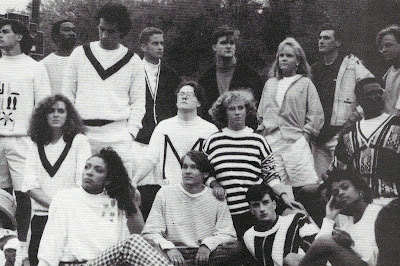 As far as the Vogue Ad, I only know the same, Kirt Suomela, Mike Wiley, and Brian Dutil on the very right back row. The year was 1988. I remember because the photos were taken the day I received a scholarship, of which I still have a framed copy. But I no longer have those clothes, or any color in my hair. Anyone know what Brian Dutil is up to today? Have an e-mail address? Thanks. Too funny! I remember those hairstyles on Mike and Kurt! Wonder if they still have those. I do believe that is Kevin Dutil next to Brian. Kevin Dutil is an old, old friend...we're talking fourth grade! Haven't spoken to him in eons. What a SHOCK to find him in a picture on this site. I have to ask, Kelly Wallace, did you go to Summerfield? Longfellow? I lost track of him after Longfellow. Funny what 20 years does to memory and nostalgia. I remember hanging out at your house a couple times with Matt (Scott) Brown. I remember your convertable chevy cav too. 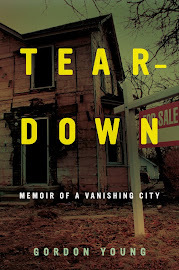 I hadn't thought about Flint in a long time, then considered going to Power's 20 year reunion in Nov. '06. I even made the trip to Flint and hung out for an afternoon with Ann Hall (Talefaro) but never made it to the reunion, which I regret. One person I'd like to say hi to is Colby Stein. I have this terrific photo of her and me in art class. Always loved her personality. I was looking for a picture of the Rusty Nail online and for some reason this popped up. Too funny. That's me (Peter Johnson) on the left side of both photo's. And someone is correct, the year was 1988. First photo was taken @ atwood stadium by Bob Melet. Oh well back to searching for the photo. Peter, let me know if you find a shot of the Rusty Nail. I'd love to run it.